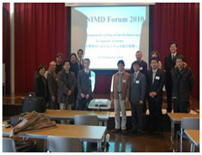 The NIMD forum has been implemented by National Institute for Minamata Disease according to invite researchers who are experts of mercury investigation every year. 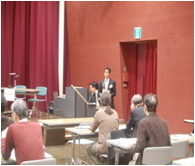 In this NIMD forum 2010, researchers introduce as for the latest results of mercury investigation on methylmercury cycling in aquatic systems till now, then these results were reported in Japanese mass communication. Also, to obtain better understanding as for each presentation in this forum, we utilized a simultaneously translation system as well as the last time. As a result, more than 100 persons participated to our forum. Thank very much for participants and lecturers in this forum. In addition, a study visit program that was made for knowing on Minamata gained popularity from foreign researchers. Session B “Chemical　modification of mercury in environment"